A PERSONAL NOTE: My apologies in advance to a number of good friends and colleagues who are still trying to get wine profile systems to work. But, as you read on, my hands-on experience and further research leads me to believe that the system has inherent problems that will prevent it from reaching the potential that we all had hoped for. Psychology, education, life experience, vocabulary and other factors continually sabotage the usefulness of wine descriptions as an accurate way to help people choose wines they will like. For this reason, profiling wines has been tried for some time now as a logical way to finesse the biases and inaccuracies inherent in individual interpretation of words. The profile concept says that if an expert evaluates a wine according to a set of organoleptic standards (tannin, fruit intensity, acidity, oak etc.) it creates an objective profile for that wine. Theoretically, consumers can evaluate the same wines and create their own personal profiles. Those personal profiles can then be compared with wines profiled by the experts to develop a match that identifies wines the consumer will like. That fails when tested in the real world. The profile example, below, is the output of SmartTaste — a data-based, preference recommendation engine I invented in the mid-1990s. It was the first implementation of an automatic, online data-based system designed to match people’s preference profiles with given wine profiles created by professional critics. SmartTaste was inspired by a method used by Master Sommelier Peter Granoff in Virtual Vineyards — his bleeding edge wine web site that lit up a constellation of ideas and broke the first real ground for wine on the brand-new World Wide Web. SmartTaste began with a professional tasting panel — usually five or six — most of whom were well-known to anyone who followed wine media critics. Tastings were done completely blind. The professionals created the reference profile and a numerical rating on a 100-point scale. Website visitors were then invited to use the same scale to describe and rate wines they had tasted. 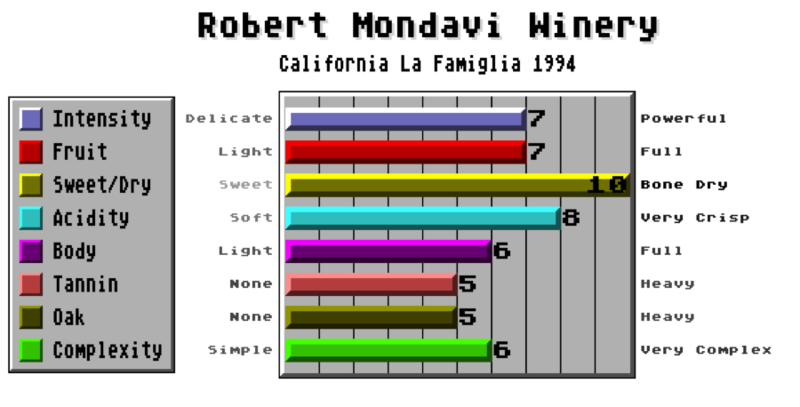 Using that data, the SmartTaste system then created a profile of wines that consumers liked and matched it to the expert wine profiles. SmartTaste failed the consistency test. It was better than random choices. but not by a lot. The best — but not great — results were with serious wine lovers who had studied wine, drank a lot of it and had — in many ways — already calibrated his/her taste to that of well-known critics. SmartTaste failed the average consumer. Interviews with consumers and a closer look at the expert rating process revealed why. First of all, even the expert taster profiles and ratings varied. In fact, they were substantially different on the exact levels of tannins, complexity and other organoleptic measures. They also disagreed on ratings, frequently by more than 5 points on the 100-point scale. Sometimes the variations were 10 points or more. Disagreements were resolved by a consensus discussion. This meant that the profiles were composites lacking in precision. This was when I first began to consider that the best matches would result from matching a specific consumer profile with a specific expert taster. In addition, numerical systems of every sort, tended to produce a grouping toward the middle. The problem with profiles — like every other system based on expert opinions — is that they don’t scale. That means that no profile, no expert recommendation is available for at least 75,000 wines out of the 100,000 available. It took me five years to find a local wine expert, lets call him Victor Vino , who could find me bottles I would like. He’s accurate about four out of every five bottles. Victor be at work when I want to shop. I have the excess time to spend 10 or 15 minutes discussing wines. The recommended wines fit my budget. Articles like, “Why You Need To Divorce Your Wine Guy” describe other frictions in the system. After the sale of my businessesm Wine Business and SmartTaste in 1997, I spent a period as a columnist for TheStreet.Com, WallStreetJournal.Com, and MarketWatch. In 1999, I founded PocketPass, an internet payments company. Among other things I invented there were the first mobile phone payments. But what was more important to wine than bleeding edge mobile payments technology, was the consumer-facing aspects of online payments. Pocketpass gave me a Ph.D. education in consumer transaction friction.I learned it took very little friction for consumers to go elsewhere (or leave elsewhere and come to me). I also learned the absolute necessity to live in the consumer’s bubble. After PocketPass was sold to a public company in 2005, I still could not satisfy my need for discovering new and different wines that I liked. That was when I founded SavvyTaste along with long-time friend Mac McCarthy (the inventor of the Dummies books) and programmer son William Perdue. SavvyTaste began in 2008 as a “new and improved” variation of SmartTaste. I revised the rating system, simplified the organoleptic profiles and introduced the concept that any wine you liked was good wine regardless of the critics. We eventually got rid of the organoleptic profiles. They didn’t work in their new implementations for the same reasons the old ways failed at SmartTaste. I had hoped to being some order to user wine descriptions by aggregating reviews, textually analyzing them for unifying commonalities then using that as a basis for wine recommendations. But that eventually failed because words get in the way: Words: Big Trouble For Tasting Notes. By 2010, it was clear that a completely new paradigm was needed. The SavvyTaste Facebook app had served its purpose. It did have a useful database that users liked to keep up with their own wines … along with a favorites list and a gift wish list. But Facebook kept changing their interface and authentication methods so often that we simply had no time to keep repairing that. So the app went away. Still, I figured there had to be another way. It took me more than two more years of work before I realized what that whole new idea looked like.